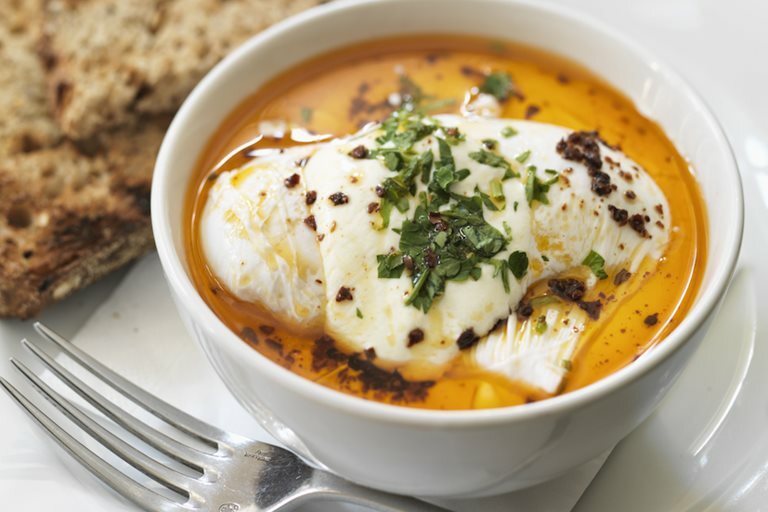 Peter Gordon's Turkish eggs recipe produces the perfect brunch - big on flavour and not too complicated. He first came across this dish in Istanbul, and it is has become a regular on his restaurant menus ever since. "These eggs are inspired by a simple Turkish dish called “cilbir". I tried them in 2000 on my first visit to Istanbul, when I went over to meet Tarik and Savas, who had approached me to consult on their soon-to-open restaurant Changa. I took the consultancy on as I immediately fell in love with Istanbul, and I’ve been there around 50 times since. It’s a wondrous and sprawling city, full of exotic ingredients, fantastic people, incredible sights and amazing culinary traditions - dating back to the Ottomans and before. In fact, there are records of cilbir being served to Ottoman sultans in the 15th century. I came back to London and we put these eggs on the menu at The Providores and also at Kopapa (although we dropped the garlic! ), and they continue to be one of our biggest-selling dishes. If you haven’t been to Istanbul then you are missing out on one of the great culinary cities in existence."